Last year around the commemoration of WWII, I found myself discussing the influence of stories of hardship and suffering with someone who had lived under communist dictatorship. Anne Frank came readily to mind. The intense humanness of her account exceeds all superficiality. At least, that is what you like to think if you, like myself, are working in the field of human rights. My interlocutor, having lived under dictatorship, agreed but was less positive. Do we really understand what people like Anne Frank are communicating? Visual language might help here. There is an artist who created a visual counterpart to Anne Frank’s story and its universal ring. It’s the artist Felix Nussbaum, who took it upon himself to depict humanity while being subjected to the Shoah. Like Anne Frank he had a few courageous souls who saved his unwelcome work. Around 400 of his known 456 paintings are still in existence. A special museum has been opened in his birthplace, Osnabrück, Germany, in the midst of the place where evil raged in all its ugliness. Two self-portraits deserve to be viewed in the context of the message of Anne Frank. In the first one (see above) Nussbaum shows himself with his compulsory identity card and Star of David. The wall behind him alienates him from the outside world, at least physically. The identity card from his location of exile in Brussels, Belgium, and the Star of David psychologically isolate him even further. His right hand pulls his coat shut in a self-protective gesture. Dutch well-known author Geert Mak calls this painting ‘an act of protest’. But it is more. It informs us about the capacity of the human race to drive victims into isolation. We see a dead tree behind the wall. The one at Golgotha was not the last. The gaze of the artist engages us, asks us where we stand. He has remained completely alive, fully human. This message is being brought home even more intensely in Nussbaum’s last known self-portrait. The artist depicts himself as he is just starting to work. The bottles in front of him are labelled ‘Mood’, ‘Nostalgia’ and ‘Suffering’, while the fourth one has the poison warning sign. The date on the backside of the painting in this painting leaves no doubt as to when it was made: August 1943. A mask in the background underlines how surreal the situation is. As does the pipe in Nussbaum’s mouth, recalling the famous painting of 1929 by the Belgian surrealist artist René Magritte entitled La trahison des images (The Treachery of Images). The artist looks at us attentively, hoping to inspire a response. We see an unspoiled human spirit, like that of Anne Frank. When you visit Amsterdam and pass the house where Anne Frank was hiding, you will find long queues of admirers who want to visit the house turned into a museum. This is not the case in Osnabrück, where the Germans gave Nussbaum a fantastic museum designed by the famous architect Daniel Libeskind (Jewish Museum, Berlin and Ground Zero NYC) next to the former local Nazi headquarters. Neither do we see many tourists in Brussels in the house where Nussbaum was hiding and betrayed. Do we really understand what the testimonies of their lives mean and communicate? Felix Nussbaum and Anne Frank give us ample opportunity for reflection. So do other thoughtful people who experience the yoke of tyranny. 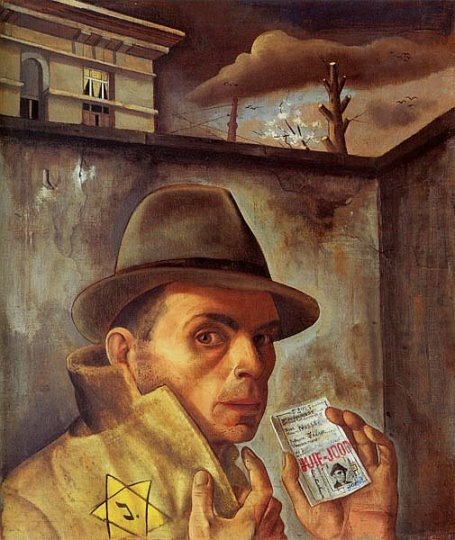 Felix Nussbaum: Self-Portrait with Jewish Identity Card, 1943, oil on canvas, 56 x 49 cm. 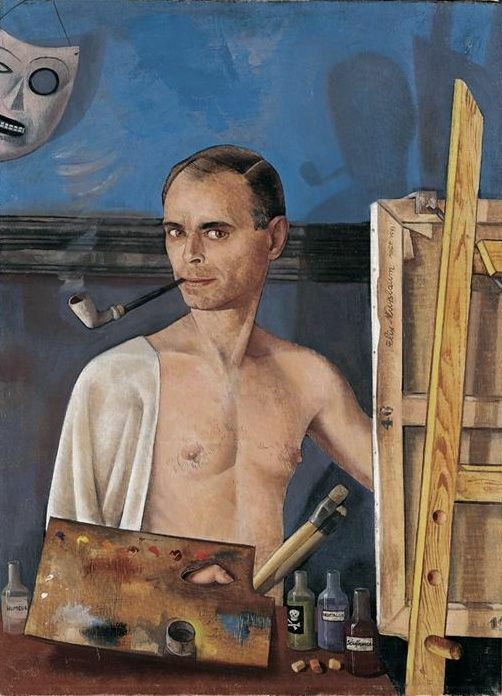 Felix Nussbaum: Self-Portrait with Easel, 1943, oil on canvas, 75 x 55 cm. Felix Nussbaum (1904-1944) was a German-Jewish painter of New Realism and victim of the Shoah. Nussbaum was born in Osnabrück, Germany, as the son of Rahel and Philipp Nussbaum. His father encouraged his son’s artwork passionately. During a scholarship in Rome in 1933 he witnessed Hitler’s Minister of Propaganda visiting and explaining that artists needed to promote heroism and the Aryan race. He realized the depth of the evil forces at hand. His partner, artist Felka Platek, was with him. They fled to Brussels where they experienced much turmoil but had productive years. In July 1944, two months before the liberation of Brussels, the Germans found them in their hiding place. Both died in Auschwitz on 9 August, 1944.